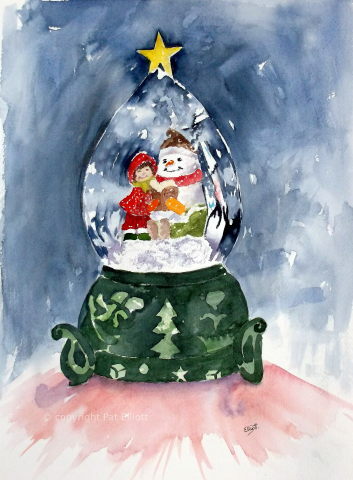 Pat Elliott Paintings: Snow Day, a painting of glass and figures. I love Snow Globes. Shake them all and all the "snow" falls softly around the figurines encased in glass. At Christmas time I have a few that are specific to the season, which come out solely at that time. This year I took some photographs and decided to paint one. The one I selected is represented here in "Snow Day"
So called because the little girl isn't at school, but being read to, by her friend, the Snowman. Painted on Saunders Waterford paper, 140lb Rough. I hope you enjoy seeing it. Dear Pat such a lovely piece. Wouldn't this make a beautiful Christmas card?? Just a thought. Hope your April is off to a fine start. Hugs! This is really lovely Pat. Great job done with the glass. Thanks, Laura. I enjoyed painting the glass, I find it very calming. Oh, that is really cute! What a lovely subject and painted so well! Great that you've found yourself painting friends in your new place! Glad you like the Globe, Judy. It was fun to paint. I love having an art club to go to. There's something about painting in company!